EXCEL IN YOUR BUSINESS, PERSONAL AND SPIRITUAL LIFE. WE MOTIVATE ORDINARY MEN TO BECOME EXTRAORDINARY. Live a Life of Success and Significance. Are you a man who's looking for support in your business life? Perhaps you have the business success and are seeking to grow in your personal life? Is connecting with men who could support and guide you spiritually be of interest to you? If these questions are of interest to you and you are desiring to excel in your business, personal and spiritual life, our Mastermind - Iron Sharpens Iron (ISI) is for you! We coach men to look outward so they can not only be successful but also significant. 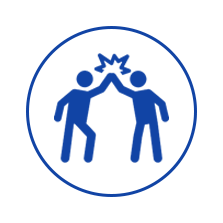 For more information about View from the Top, read about our organizations below. 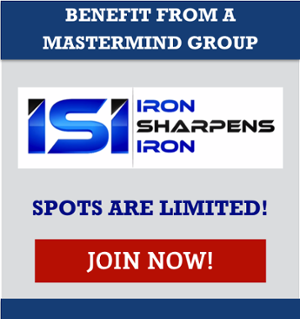 JOIN THE ISI MASTERMIND GROUP TODAY! We foster an environment of being authentic, transparent, and giving. We meet men where they are and drive them to their deepest need, being significant. We offer a one-of-a-kind Mastermind program called ISI (Iron Sharpens Iron). Each week 10-12 men join a video conference where they come to edify, encourage, and lift up one another. At our core, we are givers. By learning to fully engage in others, we help men grow and be accountable in their business, personal, and spiritual lives. "I joined ISI to invest in myself and my future. However, I stay to invest in my family and my ISI brothers." - Jonathan F.
“ISI is not just about business, it's about life, living, integrity and being the best man that I can be.” – Brian S.
“With Aaron's leadership, the men in our group are taking the journey of life together, to help us be the best versions of ourselves that we can be for our families, our businesses and for living a life of success and significance. ” – Derek C.
Relational Excellence Men of ISI will be exposed to relationships that encourage men to grow, share in discussions, book readings, and ISI community activities. Business Excellence Men of ISI will be exposed to opportunities which train them to use their God-given talents to serve those they encounter in life. This allows them to be both successful and significant. Mentorship Excellence Men of ISI will be exposed to men who can speak into their lives and hold them accountable to personal growth areas. We support them to move from vision and concept to action and execution. 6-month initial commitment to allow the Mastermind program to work in your life. Active participation through: weekly ISI group calls, one annual 2-day retreat, and dedicating yourselves to give to your ISI brothers. Willingness to grow and be supported if you are in a ditch. Willingness to be transparent, authentic, and giving. Willingness to reject pride, fear, and doubt from allowing you to be significant. Pursuit of Excellence - For over 38 years, Aaron has been a small business owner, devoted husband, and community leader. Aaron has been in a personal Mastermind with his friend. financial guru, Dave Ramsey for over two decades. Spiritual mentors David Landrith and Bob Warren have impacted his spiritual life beyond measure. Two other disciplined mastermind groups, 48 Days led by friend Dan Miller and The Torch have played a role in his understanding of how to live a significant and successful life. Aaron incorporates education and learning opportunities into his daily routine, remaining informed of the latest tools and trends available, which he shares with the men on ISI Mastermind Group.